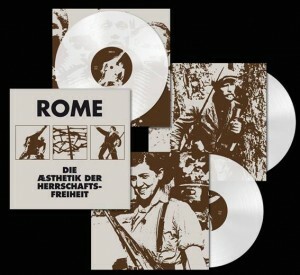 ROME have already created a highly impressive back catalogue: eleven albums and several EPs in 11 years. Since the project’s early days, Jerome Reuter has won an ever-increasing fanbase via indescribably moving and dark musical landscapes pertaining to ideological as well as historical homelessness. Reuter has always mastered the art of transporting the listener into a unique musical world. 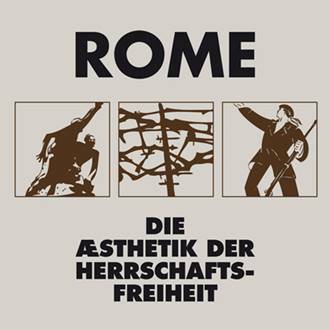 ROME’s discography is a collection of complex and interwoven works. The stylistically and musically French dominated ‘Nos Chants Perdus’ (Trisol 2010) for instance, was set in the French underground of the 1950s and 60s, whereas its predecessor ‘Flowers From Exile’ (Trisol 2009) was concerned with the Spanish civil war and the freedom fighter’s subsequent exile in France and elsewhere. As Jerome was researching both of the above-mentioned albums, there repeatedly appeared in his mind’s eye the quivering vision of a greater, underlying truth, an endeavour, an ideal, which was equally inherent in all of these histories, all of these individual biographies unearthed. This quest, during which the essence of an aesthetic gradually emerged, led to Amsterdam, southern France and Spain, and many other spots in the back yards of history. The result is a song cycle in three volumes; over 150 minutes spread across three CDs, now slightly edited for the vinyl re-issue. The cycle is bound together by spoken word parts, breathing the spirit of the works of Bertolt Brecht, Pablo Neruda, HM Enzensberger and Gustav Landauer among many others. Three albums, three different recordings, each with a different sound. Between 2010 and 2011 Jerome retreated to Belgium – which seems fitting considering that the country was at that time essentially without government – in order to live and work in a converted farmhouse studio in a secluded environment. International current events – the uprisings in Tunisia and Libya at the doorstep of Europe – accompanied the recordings and brought to the whole an acute topical connection and an unexpected but appropriate contemporary historical framework. The sumptuous packaging carries with it a whiff of extravagance and wasted grandeur, especially in a time in which freely available MP3s determine the appreciation of music consumers, and in which the relationship between music and the actual physical sound carrier is rapidly disappearing. But this work of art is no solitary pleasure. It demands to be more than a curiosity for the more sensitive parts of a washed-out bourgeoisie. The form isn’t self-congratulatory, nor are the sentiments trivial or coincidental.